These gently spiced deep-fried crabs make a fantastic starter – especially with zingy homemade lime pickle. For the lime pickle, toss the lime wedges with the salt in a large bowl. Cover the bowl and chill in the fridge for 48 hours, stirring occasionally. When the mustard seeds start popping, add the garlic and ginger and stir-fry for 1-2 minutes. Add the cumin, coriander, asafoetida and chilli powder and stir-fry for a further 1-2 minutes, then add the sugar and continue to cook until it melts. Add the cured limes and all of the juices from the bowl to the pan. Cover with the white wine vinegar and 200ml/7fl oz of cold water. Bring the pan contents to the boil, then reduce the heat until the mixture is simmering and simmer gently for 1½ hours until the mixture has thickened and the limes are very soft. Set aside to cool slightly. Blend the cooled lime pickle in a food processor for 20 seconds, or until the pieces of lime are quite small. Spoon the pickle into sterilised jars until needed. For the crab, mix all of the crab ingredients except the crabs and vegetable oil in a large bowl until well combined as a thick paste. Add the crabs and mix again until the crabs are coated in the spicy mixture. Cover the bowl and chill in the fridge for at least two hours. Before cooking, remove the crabs from the fridge and return to room temperature. Fry the spiced crabs (in batches if necessary) in the hot oil for 1-2 minutes, or until cooked through. Remove from the oil using a slotted spoon, then set aside to drain on kitchen paper. Season with a little salt. 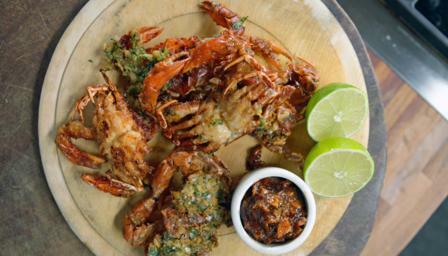 Serve the spiced soft-shell crabs with dollops of the lime pickle. Tip: it’s best to make the lime pickle about a week in advance so that the flavours can develop.